Police officers are wasting vital time “at their keyboards” due to the failure of a £46 million IT project, MSPs have been told. The controversial i6 system was scrapped last year after testing discovered a series of glitches just as it was about to go live. Martin Leven, Police Scotland’s head of IT, said the failure meant data continued to be inputted into multiple systems, wasting time that could be spent out in the community. MSPs on the Scottish Parliament’s justice sub-committee on policing yesterday heard evidence from Police Scotland and the Scottish Police Authority following the publication of an Audit Scotland report on i6 earlier this year. In March, the public spending watchdog said there was “an urgent need for a frank assessment of Police Scotland’s IT requirements”, with police officers continuing to struggle with out of date systems. The project, due to provide savings worth £200m, was abandoned when the SPA, Police Scotland and technology firm Accenture mutually agreed to end the contract. 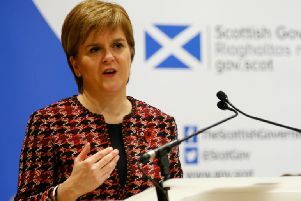 It had been due to bring together more than 100 existing systems belonging to the country’s eight former police forces, which Police Scotland is currently spending £1m a year maintaining. Mr Leven said the failure of i6 meant police officers continued to input data into multiple systems. He said the project’s cancellation had made it more difficult for Police Scotland to roll out smart devices such as tablets to officers. Asked if the effectiveness of officers had been affected by the scrapping of the project, he said: “I believe it has. There’s no detriment to what they were doing before. Officers and staff around the country operate in the way they did before i6 was due to come in. Mr Leven said the successful implementation of i6 would have made life easier for officers, meaning “less time spent at keyboards and more time spent in communities”. SPA chairman Andrew Flanagan told MSPs there had been an “overconfidence” the project would be delivered successfully. He said: “It was a very ambitious project to take a single system approach. It’s a lot like putting all your eggs in one basket.